Luckenbach Texas – Let's Go RVing! So far on our January journey we have done six hikes (but who’s counting – us!) 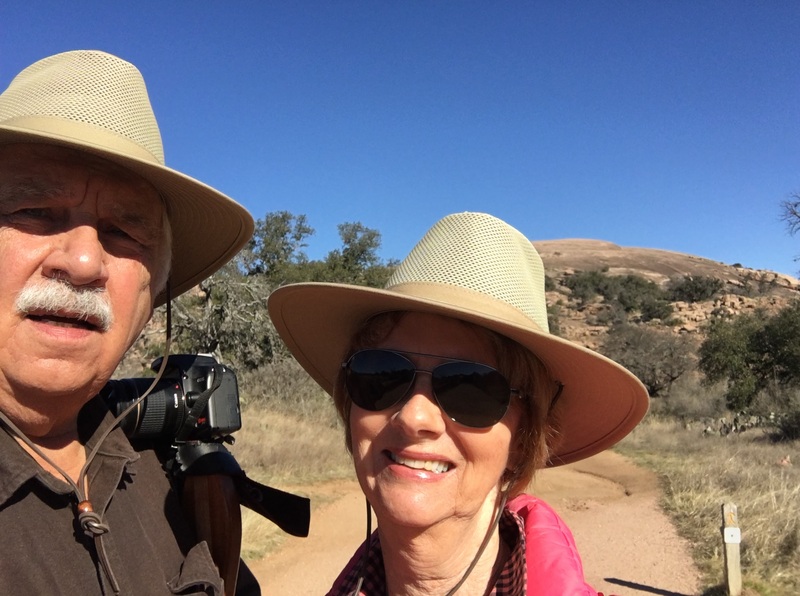 and we thought a trip to Enchanted Rock in Fredericksburg, Texas would be another great hike. It was great but it wasn’t a hike, it was a climb! Up 425 feet in .67 miles. Whew. There was hardly any flat area and we literally climbed all the way to the top. Of course we had a couple of rest stops, ok, maybe one or two more but the climb was so worth it. We had heard that the park could get really crowded on the week-ends so we decided to go during the week and in the early morning. Well, we made it by about 10:30, early for us but I was amazed during the climb at how many people were there. I can’t imagine how crowded it must get on the week-end. Someone told me Fredericksburg and the Enchanted Rock was the number one tourist spot in Texas. Don’t know if that is true but it was busy today. We chatted with a couple who only live 2 hours away but had never been before. We also chatted with a RV full timer plus a couple from Minnesota. There were all ages and sizes and I didn’t see anyone turn around. Enchanted Rock is a small part of a large underground rock called a batholith. More than 50 million years ago erosion uncovered part of the rock and weathering and erosion of that bedrock made the rock that we climbed today. It is a small speck compared to the huge underground rock that spans over 100 square miles. Now, that’s big! This is an exfoliation dome in that Enchanted Rock continuously “sheds” its outer layers of rock as it contracts and expands. The result is large curved sheets of rock that break up and can eventually slide down the rock. I guess that’s what makes it so difficult to climb. Perhaps the most poignant moment of the entire trip occurred to day. 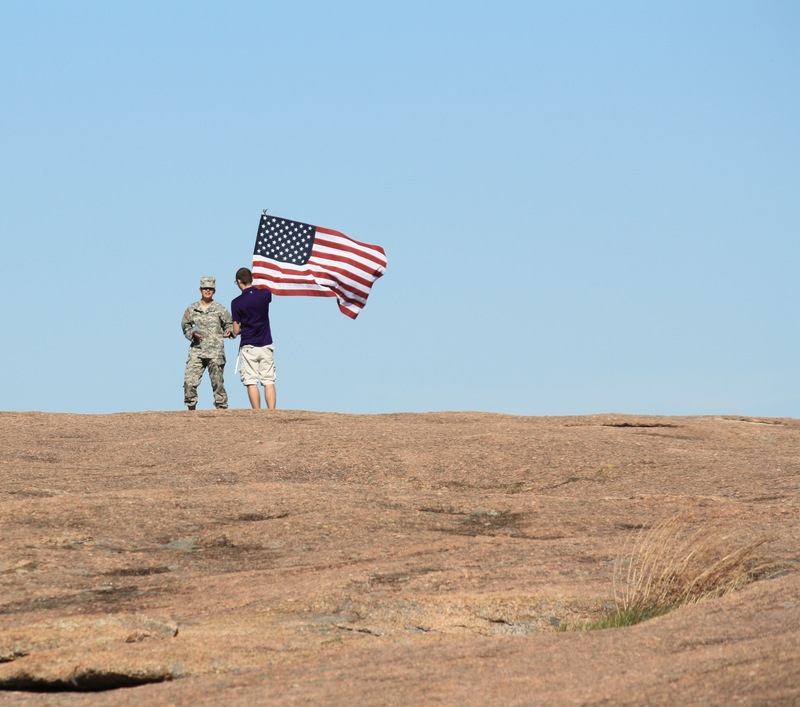 I didn’t know it but today is Freedom Day and I suddenly saw an American Flag being carried up to the top of the rock. There was a young lady dressed in uniform and proudly carrying our flag up. There were many people who had their picture taken with her and offered their sincere thanks for her contribution. As we left Enchanted Rock we decided to stop in Fredericksburg for lunch. I had seen a restaurant that advertised the best burgers in Fredericksburg and also quiche. Sounded like a win-win to me so we headed to Wheelers Restaurant. Ham and cheese is not my favorite quiche but it was the quiche of the day so that’s what I got. Jerry of course got a burger. We topped our meal off with sweetbread pudding draped in almond sauce. It was tasty! Our plan was to go on back to the RV but somewhere along the way we decided to ride to Luckenbach, the town where everybody is somebody. Jerry was a bit skeptical thinking it was going to be another Cadillac ranch site but it really was interesting. Members of the Luckenbach family along with some other immigrants moved to Luckenbach from Fredericksburg in the 1850’s and settled along Grape Creek. They soon established a school and a post office. The town has a general store full of most any tourist memorabilia you might want. At the back of the store is a bar selling beer. There are a couple of very still cats there and I heard one couple arguing about whether or not the cat was alive. He was but he was super still even with all of the activity around. Outside at the back of the store they have continuous music. Today was a singer with his guitar. While he was singing an older man in shorts and spindly legs hobbled up with his guitar and joined him. Wow – when he started playing and singing he looked like a young man. He didn’t play long, sang a couple of songs he had written and then one about Luckenbach. Both of the singers sang songs that told stories. Exhausted, we headed back to Fredericksburg with a quick stop at Walmart for our last run on groceries. When we got back we both hit the sofa for a little nap!